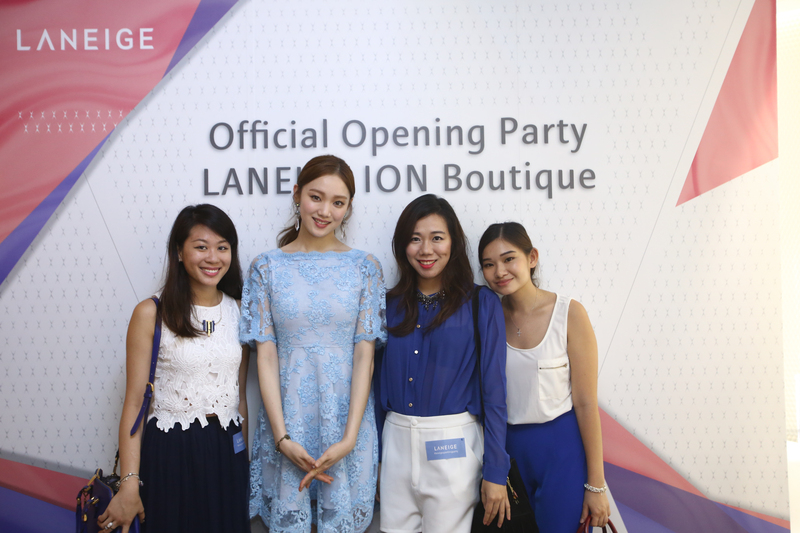 Earlier in January, Laneige debuts its new store concept, Water Meets Light, at its flagship ION Boutique store! I was invited to the opening where we met and even took photos with their new global ambassador, rising starlet Lee Sung Kyoung. She’s so tall and beautiful, not to mention her gorgeously clear skin that I can only yearn for! The flagship boutique at ION Orchard is the first in the world to embody the boutique version of the new store identity “Water meets Light”. It really goes to show how Singapore is at the forefront of beauty technologies *proud* ! The new store features a special in-store Beauty Mirror where users can explore latest K beauty looks and virtually try on the wide array of makeup that LANEIGE carries. It’s like your ‘mei tu xiu xiu’, just that it is 3D with views from different angles, much easier to use and it maps looks and colors onto your face with astonishing accuracy! Check out my video below (fast forward to 6min 27s) to find out what I mean. Now there’s no need to try on 5 different eye shadows and 10 different shades to pick out the right one! 01 – Skin Relief (Soothing) MY FAV!- Soothes and calms dry, sensitive skin, moisturises, and forms a protective layer over the skin to protect it from external aggressors. It contains Skin Relief Waterä, which contains cypress tree extract renowned for its soothing properties. 02 – White Plus Renew (Whitening) – Brightens up the skin tone and replenishes moisture. Melacrusheräto break down melanin. Also contains green tea extracts to replenish moisture. 03 – Sparkling Water (Brightening) – Makes the skin look bright and clear, stimulating the effect of sparkling carbonated water. Brightening Sparkling Waterä, whose unique micro-carbonation massage helps remove dead skin cells, stabilise skin cell turnover, and promote circulation. 04 – Water Bank (Moisturising) (I put this in my office for mid-day moisture replenishemnt)- Improves the skin’s ability to generate and retain moisture. Moisturizing Biogeneä, which penetrates the skin to activate the skin’s natural ability to generate and retain moisture. 05 – Water Sleeping Pack (Mist Pack) Instantly refreshes and moisturises the skin, as if you have had a good night’s sleep. Moisture Wrapä to instantly purify and deeply moisturise tired skin by forming a breathable moisture film over the skin to lock in moisture. 06 – Time Freeze (Face-Fit) Improves skin elasticity and firms up the skin. Dynamic Collagenä to help you achieve a youngerlooking complexion by reinforcing the hyaluronic acid layer, which supports collagen regeneration. 07 – Clear C (Anti-Oxidant) (First Runner Up IMO! I use it to set my makeup, find that it lets my makeup last longer.) Offers anti-ageing benefits while brightening the skin. Superberry Extractä, which has four times the antioxidative effect as compared with vitamin C, to reduce skin’s oxidative stress. I’ve also talked about the Water Science Mist in my vlog above (jump to 2:21) so do remember to watch it if you have not already! Let me know if there’s any other Laneige products that you’ld like me to review! Talk soon!